Bubble Soccer Rental | ThePGGames.com Deerfield IL. Bubble Soccer is an amazing rush for you and the other participants. Bump, roll, and knock into your opponents while playing a variety of game types including soccer, protect the president, relay races, and more. This attraction can only be rented with attendants supervising game play. No drop offs or pick ups allowed. 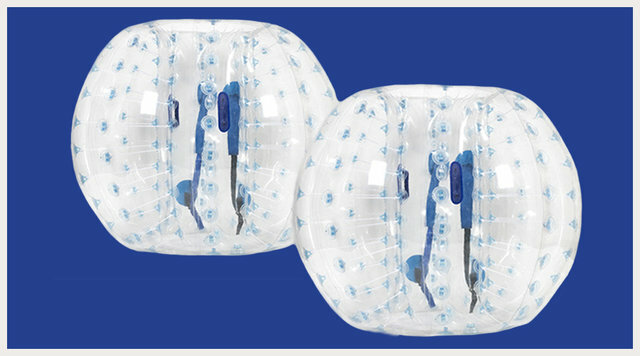 Bubble Soccer can be added to packages for larger events. Includes: 60 minutes, 20 bubbles, 4 goals, 2 soccer ball, 2 referees. Add time for increased game play. MUST READ: This attraction requires a waiver. Our waiver is required to be signed by all participant guardiangs age 7+ y/o, to participate. Waivers should be signed ahead of time, as there is not always an option for the waiver to be signed at an event. If a participant does not have a signed waiver, they will not be allowed to play at event until client receives parent's signature for waiver. Waiver is available via a link that can be emailed out in during the contract process for your event. This link can be sent out multiple times to all participants. If you would like instead, CLICK HERE to download waiver.